I've gone on record saying Rendlesham might be the turning point in history that leads to the explanation of the UFO phenomenon"
The Rendlesham Forest incident is the name given to a series of reported sightings of unexplained lights and the alleged landing of a craft or multiple craft of unknown origin in Rendlesham Forest, Suffolk, England, in late December 1980, just outside RAF Woodbridge, used at the time by the U.S. Air Force. Dozens of USAF personnel were eyewitnesses to various events over a two- or three-day period. It is the most famous UFO event to have happened in Britain, ranking amongst the best-known UFO events worldwide. Along with the Berwyn Mountain UFO incident, it has been compared to the Roswell UFO incident in the United States, and is sometimes referred to as "Britain's Roswell". The Ministry of Defence (MoD) denied the event posed any threat to national security, and stated that it was therefore never investigated as a security matter. Later evidence indicated that there was a substantial MoD file on the subject, which led to claims of a cover-up; some interpreted this as part of a larger pattern of information suppression concerning the true nature of unidentified flying objects, by both the United States and British governments (see the UFO conspiracy theory). One person to take this view was eyewitness and Deputy Base Commander Colonel Charles Halt (see below). Another was former NATO head and UK Chief of the Defence Staff Lord Peter Hill-Norton, who stated whatever happened at this USAF base was necessarily of national security interest. However, when the file was released in 2001 it turned out to consist mostly of internal correspondence and responses to inquiries from the public. Sceptics note that the lack of any in-depth investigation in the publicly released documents is consistent with the MoD's earlier statement that they never took the case seriously. Included in the released files is an explanation given by defence minister Lord Trefgarne as to why the MoD did not investigate further. The sightings have been explained as misinterpretation of a series of nocturnal lights – a fireball, the Orford Ness lighthouse and bright stars. The main events of the incident, including the supposed landing or landings, took place in the forest, which starts at the east end of the base runway or about 0.3 miles (0.5 km) to the east of the East Gate of RAF Woodbridge, where guards first noticed mysterious lights appearing to descend into the forest. The forest extends east about 1 mile (1.6 km) beyond East Gate, ending at a farmer's field, where additional events allegedly took place. Orford Ness lighthouse, which sceptics identify as the flashing light seen off to the coast by the airmen, is along the same line of sight but 5 miles (8.0 km) further east of the forest's edge. Retired Sgt. John Burroughs (LE) states that the events took place over three successive nights (pm into am); 24–25, 25–26 and 26–27 December 1980. However, one of the key pieces of primary evidence (the "Halt memo", described below) suggests that the first sightings were on the night of the 26th–27th. The memo was written almost two weeks after the event and its author later agreed that he had probably made a mistake in his recollection of the dates. This discrepancy in dates has not only confused subsequent researchers but also led to confusion at the time, for example in the MoD's investigation and analysis of contemporaneous radar records. Halt also describes seeing the UFO on the morning of the 29th, but it seems that his experience was in the early hours of the 28th. Around 3 a.m. on 26 December 1980 (reported as the 27th by Halt, see below) strange lights were reported by a security patrol near the East Gate of RAF Woodbridge apparently descending into nearby Rendlesham Forest. Servicemen initially thought it was a downed aircraft but, upon entering the forest to investigate they saw, according to Halt's memo, a strange glowing object, metallic in appearance, with coloured lights. As they approached, it moved through the trees, and "the animals on a nearby farm went into a frenzy" (but see below). The craft left three impressions or depressions in the ground that were visible the next day. One of the servicemen, Sgt. Jim Penniston, later claimed to have encountered a "craft of unknown origin" and to have made detailed notes of its features, touched its "warm" surface, and copied the numerous symbols on its body. The object allegedly flew away after their brief encounter. Penniston also claimed to have seen triangular landing gear on the object. 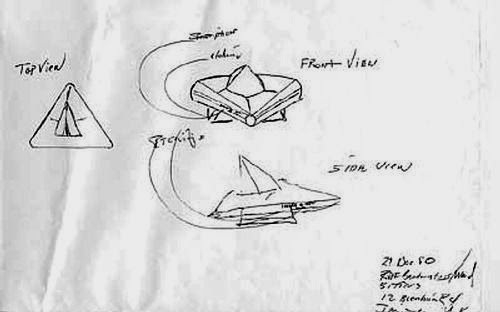 While undergoing regression hypnosis in 1994 Penniston subsequently claimed that the "craft" he encountered had come from our future, and was occupied by time travellers, not extraterrestrials. Sgt. Penniston's report made shortly after the incident contains no mention of physically encountering an unknown craft, nor of interacting with it. This report and associated sketches are neither signed nor dated, nor are they representative of AF Form 1169, Statement of Witness. Several servicemen and Halt returned to the site again in the early hours of 28 December 1980 (reported as the 29th by Halt) with radiation detectors which detected radiation in the depressions and on the near side of a tree, although the significance of the readings they obtained is disputed. The deputy base commander Lt Col Charles I. Halt investigated this sighting personally and recorded the events on a micro-cassette recorder (see "The Halt Tape", below). The site investigated by Halt was near the eastern edge of the forest. The first public report of the incident was published in the tabloid newspaper News of the World, on 2 October 1983, beneath the sensational headline UFO lands in Suffolk – and that's official. The story was based on an account by a former US airman, using the pseudonym Art Wallace (supposedly to protect himself against retribution from the USAF), although his real name was Larry Warren. Letter from Lt. Col. Charles Halt. Click to read transcription or to see at larger resolution. The first piece of primary evidence to be made available to the public was a memorandum written by the deputy base commander, Lt. Col. Charles I. Halt, to the Ministry of Defence(MoD). Known as the "Halt memo", this was made available publicly in the United States under the US Freedom of Information Act in 1983. The memorandum (left), was dated "13 Jan 1981" and headed "Unexplained Lights". The two-week delay between the incident and the report might account for errors in dates and times given. The memo was not classified in any way. Dr David Clarke has investigated the background to this memo and the reaction to it at the Ministry of Defence. His interviews with the personnel involved confirmed the cursory nature of the investigation made by the MoD, and failed to find any evidence for any other reports on the incident made by the USAF or UK apart from the Halt memo. These documents describe the sightings of strange lights. Penniston, for instance, states that "directly to the east [of East Gate] about 11⁄2 miles [2.4km] in a large wooded area...a large yellow glowing light was emitting above the trees. In the centre of the lighted area directly in the centre ground level, there was a red light blinking on and off 5 to 10 sec intervals. And a blue light that was being for the most part steady." Burroughs, Penniston and Cabansag drove into the forest in search of the source of the lights. They heard strange noises, too. Burroughs reported a noise "like a woman was screaming" and also that "you could hear the farm animals making a lot of noises". Halt heard the same noises two nights later. In a CNN interview in January 2008 he said: "The livestock around the barn seemed to be going crazy". Such noise could also have been made by Muntjac deer in the forest, which are known for their loud, shrill bark when alarmed. Cabansag said: "We figured the lights were coming from past the forest since nothing was visible when we passed through the woody forest. We would see a glowing near the beacon light, but as we got closer we found it to be a lit-up farmhouse. We got to a vantage point where we could determine that what we were chasing was only a beacon light off in the distance.” Burroughs' statement also states that "We could see a beacon going around so we went towards it. We followed it for about two miles [3 km] before we could [see] it was coming from a lighthouse." Penniston's statement is the only one that positively identifies a mechanical object as the source of the lights. He states that he was within 160 feet (50 m) of the object and "it was defidently mechaniclal [sic] in nature". Penniston has subsequently claimed that, contrary to his statement at the time, he actually encountered a landed craft in the forest which he circled, touched and made notes of for 45 minutes, although there is no corroborating evidence of this from other witnesses. Penniston has shown on television a notebook in which he claims to have made real-time notes and sketches of the object. The notebook is headed with the date 27 December and the time 12:20 (00:20 GMT), which does not accord with the date and time given by the other witnesses for the incident, although the date does accord with Halt's memo. Penniston claims that he saw the object at a different landing site from the one investigated by Halt, much closer to RAF Woodbridge. This is inconsistent with his initial assessment that the light lay a mile and a half from East Gate. "I believe the objects that I saw at close quarter were extraterrestrial in origin and that the security services of both the United Kingdom and the United States have attempted—both then and now—to subvert the significance of what occurred at Rendlesham Forest and RAF Bentwaters by the use of well-practiced methods of disinformation." "While in Rendlesham Forest, our security team observed a light that looked like a large eye, red in colour, moving through the trees. After a few minutes this object began dripping something that looked like molten metal. A short while later it broke into several smaller, white-coloured objects which flew away in all directions. Claims by sceptics that this was merely a sweeping beam from a distant lighthouse are unfounded; we could see the unknown light and the lighthouse simultaneously. The latter was 35 to 40-degrees off where all of this was happening." Contradictions between this affidavit and the facts as recorded at the time in Halt's memo and tape recording have been pointed out. In 2010 base commander Colonel Ted Conrad provided a statement about the incident to Dr David Clarke of Sheffield Hallam University, UFO adviser to the UK National Archives. Conrad stated that "We saw nothing that resembled Lieutenant Colonel Halt's descriptions either in the sky or on the ground" and that "We had people in position to validate Halt's narrative, but none of them could." In an interview, Conrad, criticised Halt for the claims in his affidavit, saying "he should be ashamed and embarrassed by his allegation that his country and Britain both conspired to deceive their citizens over this issue. He knows better.” Conrad also disputed the testimony of Sergeant Jim Penniston, who claimed to have touched an alien spacecraft; he said that he interviewed Penniston at the time and he had not mentioned any such occurrence. Conrad also suggested that the entire incident might have been a hoax. Halt's partial response to this was: "Ted Conrad is either having memory problems, has his head in the sand or continuing the cover up. Even his son has admitted to family talk substantiating the incident... Through the years Conrad has made conflicting statements about the events. First he stated he never went out to look in the sky. Then stated he never saw anything. Apparently he doesn’t remember talking to me on his radio [about seeing a UFO sending down beams of light onto the base]... Remind Conrad of his article in the OMNI Magazine dated March 1983... In the article he describes the first incident in detail and concludes 'those lads saw something, but I don’t know what it was'. Now he’s smearing those involved. It’s pretty clear there was a very intense confrontation with something in the forest. Does Conrad want to talk about how the airmen were then subjected to mind control efforts using drugs and hypnosis by British and American authorities? 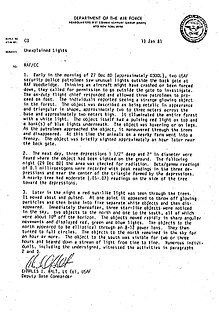 Yes, Burroughs and Penniston have issues that relate to the events..."
The 1983 OMNI article cited by Halt has the following account attributed to Conrad: "Colonel Ted Conrad the base commander... recalls five Air Force policemen spotted lights from what they thought was a small plane descending into the forest. Two of the men tracked the object on foot and came upon a large tripod-mounted craft. It had no windows but was studded with brilliant red and blue lights. Each time the men came within 50 yards of the ship, Conrad relates, it levitated six feet in the air and backed away. They followed it for almost an hour through the woods and across a field until it took off at 'phonomenal speed.' Acting on the reports made by his men, Colonel Conrad began a brief investigation of the incident in the morning. He went into the forest and located a triangular pattern ostensibly made by the tripod legs. ...he did interview two of the eyewitnesses and concludes, 'Those lads saw something, but I don't know what it was'." Suffolk Constabulary have a record, dated 26 December 1980, of a report from the law Enforcement Desk of RAF Woodbridge, stating that "We have a sighting of some unusual lights in the sky, we have sent some unarmed troops to investigate, we are terming it as a U.F.O. at present". The police investigated this report and the result is recorded as follows: "Air Traffic Control West Drayton checked. No knowledge of aircraft. Reports received of aerial phenomena over Southern England during the night. Only lights visible this area was from Orford lighthouse. Search made of area – negative." Sceptic Ian Ridpath has speculated the reported "aerial phenomena" refers to the re-entry of the Soviet Cosmos 749 satellite's final stage rocket, which was widely seen over Southern England shortly after 9 p.m. on the evening of 25 December. A letter in the police file notes that one of the PCs returned to the site in daylight in case he had missed something. "There was nothing to be seen and he remains unconvinced that the occurrence was genuine. The immediate area was swept by powerful light beams from a landing beacon at RAF Bentwaters and the Orfordness lighthouse. I know from personal experience that at night, in certain weather and cloud conditions, these beams were very pronounced and certainly caused strange visual effects." A scan of the report is available at Suffolk Constabulary's website. Some researchers have claimed that personnel from Porton Down visited Rendlesham in 1980 after the Rendlesham Forest incident.No evidence has been presented and there seems to be confusion with other alleged UFO incidents. Admiral Lord Hill-Norton, the former Chief of the UK Defence Staff, argued that an incident like this at a nuclear weapons base was necessarily of national security interest. As a member of the House of Lords, Lord Hill-Norton asked Her Majesty's Government: "Whether they are aware of any involvement by Special Branch in the investigation of the 1980 Rendlesham Forest incident [HL303]".Baroness Symons of Vernham Dean gave the reply that "Special Branch officers may have been aware of the incident but would not have shown any interest unless there was evidence of a potential threat to national security. No such interest appears to have been shown." Hill-Norton commented, "Either large numbers of people were hallucinating, and for an American Air Force nuclear base this is extremely dangerous, or what they say happened did happen, and in either of those circumstances there can only be one answer, and that is that it was of extreme defence interest." In 2001 the British Government released its file on the incident to researchers following a request from Dr David Clarke under the Code of Practice for Access to Government Documents, a precursor to the Freedom of Information Act. The Ministry of Defence has since made these documents available online. The United States continues to remain silent despite the SciFi Channel-sponsored investigation entitled "UFO Invasion at Rendlesham", the History Channel's "UFO Files – Britain's Roswell" and Coalition for Freedom of Information inquiries. Jim Penniston and John Burroughs went to investigate the craft together. In an interview with Larry King on 9 November 2007, Jim Penniston claimed that he did a 45 minutes full investigation of the craft on the ground, touched the craft and took photos of the craft. John Burroughs apparently contradicts this in a separate interview in Robert Stack's Unsolved Mysteries. He states that after suddenly encountering the craft on the ground, "We all hit the ground, and it went up into the trees". The interviews with Jim Penniston and John Burroughs have subsequently been made available on Youtube. Science writer Ian Ridpath investigated the incident in 1983, initially for BBC TV's Breakfast Time news programme, and on 5 January 1985 wrote an article for the Guardian which did much to discredit the accounts of the UFO sightings at Rendlesham. Ridpath asked local forester Vince Thurkettle about the flashing light, and he indicated that it originated from the lighthouse at Orford Ness, which as seen from the forest edge appears to hover slightly above the ground and would appear to move as the witnesses moved between the trees. At that time, the Orford Ness lighthouse was the second-brightest in Britain with an intensity of 5 million candelas. In the Halt tape (mentioned above), one can hear an unidentified airman call out "There it is again ... there it is" with an interval of 5 seconds, the same frequency at which the Orford Ness lighthouse flashes. Had a UFO been present, the airmen should have reported a second source of light (the lighthouse) in the same line of sight. Video footage of the lighthouse as seen from Colonel Halt's vantage point at the edge of the forest shows it flashing at this rate. Thurkettle saw the alleged "landing marks", as did the local police, and believed them simply to be old "rabbit diggings" covered with pine needles. USAF photographs of the marks discovered by researcher Georgina Bruni were sent to the MoD by Lord Hill-Norton in 2001 and released under the Freedom of Information Act in 2007. Moreover, the supposed burn marks in the trees were actually axe cuts made by foresters that indicated the trees were ready to be felled. To give further pause to accepting the alleged UFO sighting, a meteor "almost as bright as the full Moon" was spotted over Southern England at exactly the time of the initial reports of a bright object "landing" in the forest, according to Dr John Mason, who collects reports of meteor sightings for the British Astronomical Association. "Nothing came down in Rendlesham Forest," concludes Ridpath. Crucial amongst the evidence is the interpretation of the levels of radiation in the area (clearly heard on the "Halt tape"). Experts at the UK’s National Radiological Protection Board (NRPB) have pointed out that the equipment used for this measurement was not intended to measure background radiation and therefore the readings at the low end of the measurement scale are meaningless. Steuart Campbell proposes an alternative explanation. He agrees with the standard explanation that the incident began with the sighting of a fireball (bolide) which was interpreted by guards at the base as an aircraft falling in flames in the nearby forest. In fact it would have been hundreds of miles away over the North Sea. Campbell argues that the object subsequently seen by Halt and his men on their nocturnal expedition was the lightvessel Shipwash and that the supposed "spacecraft" were actually bright planets, such as Venus. Campbell is critical of the USAF's abilities with their equipment. Another theory is that the incident was a hoax. The BBC reported that a former US security policeman, Kevin Conde, claimed responsibility for creating strange lights in the forest by driving around in a police vehicle whose lights he had modified. Conde has since withdrawn the claim that he was responsible for the incident. "It is my impression that I pulled my stunt during an exercise. We would not have had an exercise during the Christmas holiday [when the UFO sightings occurred]. That is a strong indication that my stunt is not the source of this specific incident". It remains possible that the coloured lights seen in the forest on the first night of the incident were due to a hoax by a perpetrator who has never come forward. Other explanations for the incident have included a downed Soviet spy satellite. Some of the first people to examine the event in detail were the British Ufologist Jenny Randles in her book "Sky Crash", co-authored with local researchers, Brenda Butler and Dot Street, who were the first investigators to interview any witnesses and to visit both the site and RAF station and Nick Redfern in his books "Cosmic Crashes" and "A Covert Agenda". Georgina Bruni has researched the subject and in her book You Can't Tell the People publishes a photograph of the supposed landing site taken on the morning after the first sighting. The late Lord Hill-Norton, (Admiral of the Fleet and former Chief of the Defence Staffof the UK) also believed that a UFO landed at Rendlesham and repeatedly questioned the UK Government on the issue. Larry Warren who was the source of the original News of the World article has written extensively on the subject and is a firm believer in an extraterrestrial explanation. Warren was certainly a USAF airman at RAF Woodbridge, but his own claims that he was a witness to the incident are disputed by others, notably by Col. Halt. Bruni and Warren do not agree on the details and have clashed publicly over the supposed inaccuracies of their respective accounts. Jenny Randles, one of those who originally brought the case to prominence, wrote an extensive article in her book with David Clarkeand Andy Roberts, (The UFOs That Never Were) entitled "Rendle Shame Forest" where she came to the conclusion that "While some puzzles remain, we can probably say that no unearthly craft were seen in Rendlesham Forest. We can also argue with confidence that the main focus of the events was a series of misperceptions of everyday things encountered in less than everyday circumstances." One of the most prominent believers in the extraterrestrial origin of the Rendlesham UFOs is Nick Pope who worked for the MoD, researching and investigating UFO phenomena between 1991 and 1994. He discussed the Rendlesham Forest incident in his various books and in several articles: "Selected Documents", which relates to the MoD documents on the Rendlesham Forest incident, "Rendlesham – The Unresolved Mystery", "The Rendlesham Files Reviewed" (a detailed commentary and analysis of the MoD documents) and "Rendlesham Forest UFO Incident". He has gone on record as saying that "the Rendlesham Forest incident is bigger than Roswell" (quoted on Sci Fi Channel – see TV documentaries below). Lieutenant Colonel (later Colonel) Charles I Halt, the former Deputy Base Commander of USAF Bentwaters and Woodbridge, who was a major witness to these events, is also a firm believer and contributor to books and documentaries. As stated in his recent affidavit above, Halt believes he witnessed an extraterrestrial event that was then covered up. Halt was also a speaker at the National Press Club in Washington, D.C. on 27 September 2010, one of half a dozen former US Air Force officers testifying on the subject of "U.S. Nuclear Weapons Have Been Compromised by Unidentified Aerial Objects. The incident is now being described as "Britain's Roswell", a reference to the notorious case in New Mexico in 1947. Then, an American commander initially reported the crashing of a possible UFO, apparently with mysterious debris scattered for miles around. To type "Roswell" into a search engine is to enter a fantastical world where alien body parts are apparently cold stored in secret American bases as part of endless – and contradictory – conspiracies. The story even provided inspiration for Scooby Doo. Yet amid all the paranoia and cartoon fun there are enough eyewitness accounts to make you wonder just a little bit. It now emerges that senior American personnel gave similar credence to the British sighting. A day after the incident, a US commander supposedly found indentations near the scene in the Suffolk forest and later reported "red, sun-like light" through trees which "moved about and pulsed". Hill-Norton became a Churchillian voice in the wilderness, warning about the alien threat. He wrote to Heseltine in 1985, describing failure to prepare as "a potential 'banana-skin'," a mandarin's mild and mercurial way to describe the potential invasion of the planet by flesh-eating monsters from outer space. I was the reporter on the Mandrake column who, many years ago, first disclosed the late chief of the defence staff's new-found interest and I confess I ascribed it to the vivid imagination of a man approaching his senior years. But with plausible evidence emerging from American commanders and other sources more respectable than Glastonbury revellers – however sober – it grows harder to dismiss every UFO sighting as X-Files fantasy. Well, isn't it arrogant to assume that ours is the only civilisation? How do we know what may lurk in an infinite universe, or indeed in infinite universes? But what actually is a UFO? The newly released files highlight public and official confusion with the case of "Aurora", an American spy plane whose existence has never been admitted. In 1993 there were numerous sightings over the West Country, prompting an exchange between the Assistant Chief of the Air Staff (ACAS), Sir Anthony Bagnall to the head of the Ministry of Defence's UFO desk (yes, there is such a thing). After much debate, the UFO desk was told to drop its investigation. As Hereward Pelling, a documentary maker who has investigated numerous sightings says: "A UFO is simply unidentified – there need not be anything supernatural about it." Either way, few would have predicted this latest story, best summarised as "UFO: the comeback". After all, hadn't UFOs gone out of fashion? Hadn't digital photography shown "flying" saucers to be kitchen saucers? Hadn't we discovered enough real human threats to our security without inventing phantom superhuman menaces from galaxies far away of which we know little? How quaint it now seems that President Ronald Reagan could have posited to the Soviets that it would actually have been a blessing if humankind discovered a threatening enemy life form, so the competing nations of earth might unite against the common enemy, the lemon-headed peril. Certainly UFOs now seem rather retro, like very exotic classic cars. With reason. Pelling, whose documentary, Nazi UFO Conspiracy, says UFO fever reached its peak in the cold war. Back then man had not even landed on the moon, so space was unknown. One theory Pelling has investigated was that German scientists working for the Nazis created the first "flying saucer" and that these experts were taken to America after the war, where they continued to develop spaceship technology. "There is just about enough evidence for this to be plausible," ventures Pelling, who has interviewed many of the most prominent people in the UFO world. "What is true is that a high proportion of sightings are near military bases," he says. During the war, Allied pilots reported seeing so-called "Foo Fighters", which moved at great speed and with alien agility, and which were investigated at length by Britain and America. But Pelling says the first major sighting of a UFO was by Kenneth Arnold in 1947 in America. "The craft he describes is identical to the German Second World War Horton Brothers Flying Wing prototype that was taken by the Allies in 1945 and shipped back to the US. In turn, this flying-wing design is identical to the B-2 Stealth Bomber." America was also testing a vertical take-off flying saucer with conventional propulsion methods, though with scant success. "Perhaps," speculates Pelling "it has suited the American and British authorities to have people believe they have seen a UFO rather than so-called 'black projects', secret new kit they are trying out." Stealth Bombers do move with incredible speed and silence, so these may have confused witnesses. But such explanations don't account for the incident at the British base, where service personnel witnesses would surely recognise an aeroplane. And the American authorities appear to have taken UFOs surprisingly seriously, since Washington was supposedly "buzzed" in 1952, with even President Truman becoming involved. Ditto Britain. Long before the intervention by the chief of the defence staff, Winston Churchill was on the case. Indeed, as First Lord of the Admiralty, he is credited with the first "official" reporting of a UFO, above Kent on October 141912. The incident must have left an impression because in the Fifties, Churchill was involved in the delightfully titled, comic-book sounding Flying Saucer Working Party, which was, naturally, terribly hush, hush. More recently, correspondence has emerged from 1952 between the prime minister and his air minister asking for an assessment of the truth about flying saucers. Far from being some period piece of Cold War paranoia, the surprise is that UFO sightings are actually on the rise. A councillor in Lincolnshire recently claimed to have spotted one. A dazzling light in Norfolk has just sparked huge speculation, with independent sightings as far as Suffolk. Recently we have had alleged sightings on a television broadcast, over Hatfield House and trailing an RAF Hercules. And nor is there a shortage of those willing to believe. A Briton facing extradition to America for hacking into top-secret military computers claimed he was actually trying to expose a conspiracy that Washington is covering up its knowledge of UFOs. Sure, many "sightings" have more humdrum explanations, from meteors to the shimmering white craft that turned out to be nothing but an airship and an inevitable Virgin publicity stunt. Nick Pope, who was employed by the Ministry of Defence to look into UFO sightings, actually found that one of the biggest causes is the party craze for releasing Chinese lanterns – they float for miles, often in groups, radiate light, then suddenly disappear when the candle burns out. Pelling estimates up to 90 per cent of sightings can now be attributed to these rather soulful party emblems.